Capturing the beauty and southern charm of the Mills House Hotel in Charleston, South Carolina is easy; capturing it in a way that feels new and interesting is an entirely different matter. 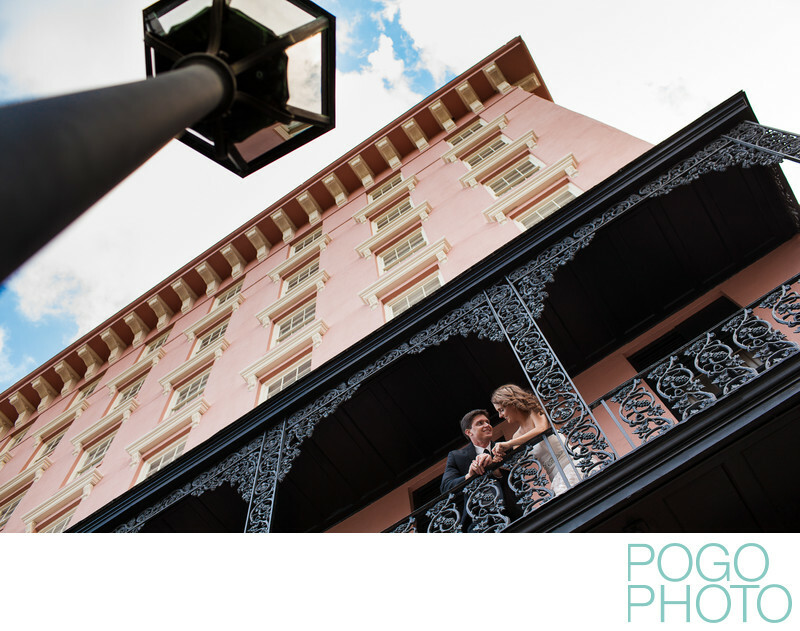 This looking up shot reveals the blush hotel towering above, the wrought iron railings, and the streetlamp, all lined up in an unusual take on a classic southern sight. Compositionally this portrait has strong leading lines rom the lamppost, the ceiling of the porch, and the roof of the hotel itself, with sharp contrast between the clouds and the dark gray/black wrought iron, and a softer contrast between the classic southern pink painted building and the brilliant blue sky. We are constantly looking to find new and eye catching ways to tell the stories of our clients, and finding ways to present a property in the deep south without feeling too stuffy or posed is an interesting challenge! We find that asking our clients to spend time chatting quietly or touching each other, reconnecting as a couple, and trying to speak to each other using only their eyes can create some great real moments that don’t feel rigid or set-up. We pride ourselves on helping our brides and grooms enjoy being photographed; no one likes being told to freeze, but everyone is happy when being told to cuddle or play. Location: The Mills House Hotel, Charleston, South Carolina. 1/320; f/4.0; ISO 400; 35.0 mm.